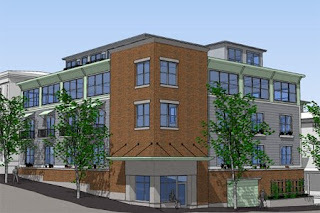 emilie inc.'s studio interior designer Tracy Davis of Urban Dwellings was interviewed for a news story last week describing a new affordable & green apartment complex she's working on in Portland. Units start at a reasonable $140K! For more information, check out the project's website for more information. And watch the video clip to meet Tracy! I'm thrilled to announce the official launch of emilie inc. associates and the website featuring three new associate photographers for emilie inc: Geneve, J, and Wyndee. Associate photographers are available for wedding dates that I am already booked or for wedding budgets that are less than my price point. Associates range in experience and price but rest assured, clients will receive the same great customer service and product quality emilie inc. is known for. So take a peek at the new site and meet the newest members of the emilie inc. team! Welcome aboard, Geneve, J and Wyndee! For those of you who are big Jules Bianchi fans, like myself, be sure to check out her new website that offers tips, specials and goodies for photographers called Jules Cafe. 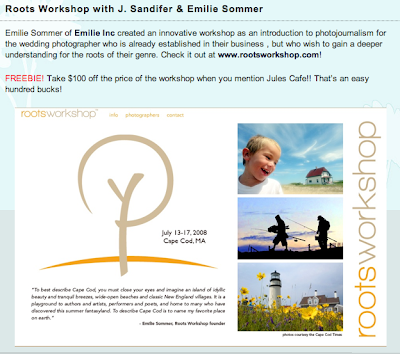 Roots Workshop is featured as a daily special! Unfortunately I can't tell you what or who I photographed today. But perhaps if you watch Martha Stewart in the next week or two, you might spot it. Sorry to be so vague, but I'll post more information as I find out myself. It's exciting!! I had the privilege of photographing Fitness for the Cure to benefit St. Jude Children's Research Hospital last weekend. You might recall that my stepmother Paula is involved with this group and I photographed this event in 2006. I was unable to attend the 2007 event so I was excited to see how much the group had grown in two years! 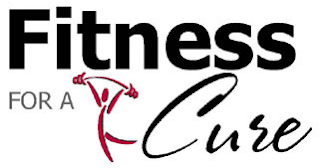 Fitness for the Cure is the brainchild of Sherri Laffey Sarrouf, a fitness instructor at Gold's Gym, wife and mother of two (I photographed her children's holiday card portrait). She has no professional dance training, but 9 years ago she organized a group of friends who liked hip-hop and decided to spread their fitness message to those in need. The group has grown to include school children and adults, and they meet once a week to practice. All of the dance routines are high energy, and include lots of fun moves! When not on stage, the other performers cheer their fellow dancers on (second from the right, front, is Sherri's daughter Elizabeth). The younger kids all wore Red Sox hats in one number. I loved this little boy waiting for the music with his Boston hat, St. Jude shirt, and hope angel necklace. The day included a Locks of Love hair cutting. This is John Moses, the CEO of ALSAC (the fund-raising organization of St. Jude). A lawyer by trade, Mr. Moses is passionate about sharing the importance of St. Jude. Photographers: I encourage you to volunteer your talent to an organization that might not have the funds to hire a professional. The slideshow I put together from the 2006 show brought in a lot of additional money for this charity simply by passing a url around to friends and family via emails. I also donated portrait sessions for this silent auction as well as a St. Jude benefit through my local Pottery Barn. One person can make a difference! It's been a few days since I've been home from Texas and I am busy catching up on those necessary things like emails, voicemails, and sleep! It's good to be home, but boy, I miss my friends from the workshop. For those who aren't familiar, the Foundation Workshop is an intense photojournalism experience for wedding photographers (and inspiration for my Roots Workshop!). This year's group included 5 teams of 5 students, each with a team leader, two shooting mentors, a team assistant and a crew of volunteers and support staff. It was a huge group (as you can see from the previous post of our group photo). It's difficult to put into words what the experience in Texas was like for me. Initially, I was nervous for my presentation on Monday morning so my concentration was making it through that (it was actually quite fun and many of the students told me they got a lot out of it). Then the focus shifted to our individual groups as the students received their assignments. I was a mentor for Brooks Whittington's team, a ridiculously talented wedding photojournalist from Dallas whose pure pj I respect and admire. Allegra and Tem Juarez rounded out the staff for our team. The participants varied in background and ability, but came together to produce an amazing body of work. This is our fearless leader, Brooks. And this is me, giving my presentation on Monday (Thanks, Ben). A shooting exercise at a local carnival with Tina and Bill (Thanks, Joe). Hard at work compiling our team slideshow for the presentation night (Thanks, Allegra). Aga Agnieszka, from NY, was assigned to cover a dance school. Aga had a frustrating first day, but knocked it out of the park when she gained some confidence to try again on day 2. Ande Aguilar from Texas was assigned to cover the daily life of a firehouse. Anil Tohani, from London (! ), was assigned to a stable. Joe Wang, from Maryland, was also assigned to a dance school, this one ballet. And Kerry Ryan, from Seattle, was assigned to the day in the life of a family. I am oozing with pride over their accomplishments in such a short amount of time. To be thrown into the documentary world with no prior experience and leave with some killer stories is a testament to the commitment of the staff and students who make this a worthwhile experience. In between all the sweat and tears, friendships have been formed that will last a lifetime! Thanks to Huy and Bill for inviting me to be a part of it!